Typical winter conditions that include a little more than an inch of snowfall and chilly temperatures that dip below 20 degrees cause death rates from heart attacks to triple among men 35 to 49 years old. One of the main culprits responsible for this upswing is snow shoveling. On Tuesday, The Early Show Medical Correspondent Dr. Emily Senay and Bally Total Fitness' Nikki Kimbrough will provide safety tips for those shoveling or soon-to-be snow shovelers. Kimbrough says snow shoveling is actually demanding on the body. Researchers have found that the energy used to shovel snow is comparable to the amount of energy needed to complete an active round of singles tennis or speed walking at 5 m.p.h. Heart attacks, back strain and muscle soreness are all by-products of the extensive physical activity involved in the assumingly simple task of snow shoveling. The good news is 15 minutes of snow shoveling counts as moderate physical activity, according to the 1996 Surgeon General's Report on Physical Activity and Health. Senay says we all should aim for at least 30 minutes of moderate physical activity of some kind on most days of the week. Shoveling, however, can be made more difficult by the weather. Cold air makes it harder to work and breathe, which adds some extra strain on the body. There also is the risk for hypothermia, a decrease in body temperature, if one is not dressed correctly for the weather conditions. Anyone who has already had a heart attack. Individuals with a history of heart disease. Those with high blood pressure or high cholesterol levels. Individuals leading a sedentary lifestyle. 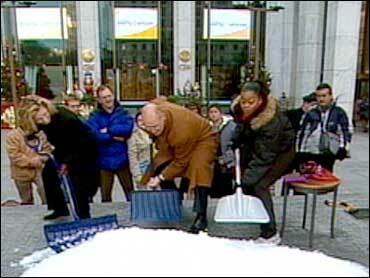 Senay says to consider back safety when shoveling snow. Even if you exercise regularly and are not at risk for heart disease, shoveling improperly could lead to a strained back. The average shovel loaded with 16 pounds of snow ends up moving 192 pounds of snow if you load your shovel about 12 times a minute. That's almost 2,000 pounds being lifted in just over 10 minutes! To maintain strong back muscles and reduce post-shoveling back strain and soreness, Kimbrough recommends the following exercises that can be done at home or in the gym. Deltoid Raise: Standing with your feet shoulder width apart, grasp a barbell or dumbbells with an overhand grip. Let the weight hang at arm's length against your upper thigh. Raise the weight straight out in front of you until it is just above shoulder level. Lower the weight to the starting position. Lateral-Pull: Stand with your feet shoulder-width apart. Using tubing or resistance bands, hold one end of the band in each hand and raise your arms straight over your head. Press your elbows down slowly to each side, squeezing your shoulder blades together, until your fists are level with your shoulders. Slowly straighten your arms up until they are back to the starting position. If you don't feel resistance when you press your elbows down, adjust the band/tube so there is less slack. NOTE: Technique is also very important. By maintaining the right posture, you can lighten the workload and stress on your body and also prevent back strain and soreness.